A few years back, I birded northern Greece with a couple from Namibia. It had been a while since I saw Greater Flamingoes and was thrilled to see them again. Nicolaas, who can see them back home any day commented that they are the most numerous wading birds in the world (the “most numerous” equaling “the least interesting”). The species he was thrilled to see was the Mute Swan. 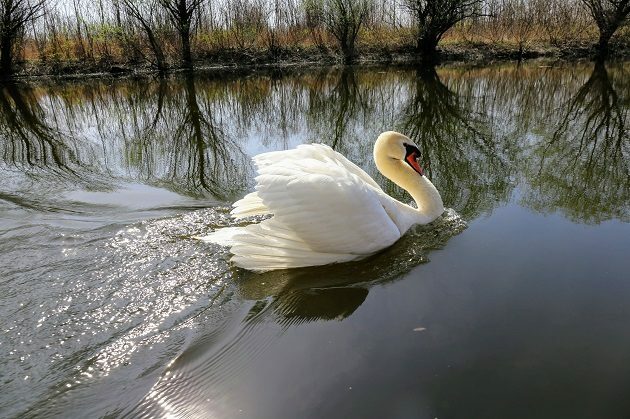 And this winter I saw a flock of 500 swans in Belgrade – nothing exciting about them? Well, for me – no, but for Nicolaas, Mute Swans were a lifer species. He has seen them before in Cape Town, but those were introduced and feral birds, while in the Balkans they are indigenous and – countable! Yesterday, I did a bit if canoeing in the Danube backwaters, opposite to the Belgrade’s Dorcol district. There were three of us, my friend Vlada in the bow, in the middle his six-year-old son who, in his bright yellow PFD looked for all the world like Spongebob Squarepants, and me in the stern. 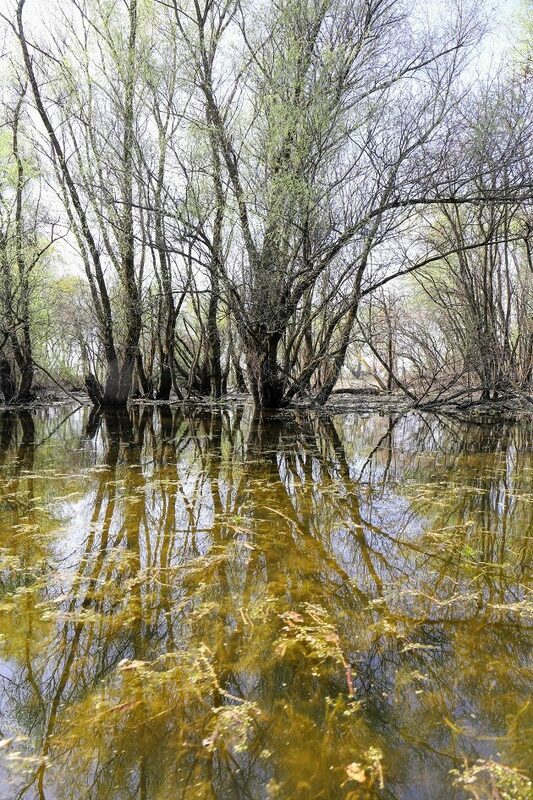 The water level was some three feet above the average, so off into the swampland we went, through a submerged forest of willows and poplars into a lake-like widening of a side branch with a few Garganeys and Green Sandpipers. It is late March, the trees are leafless, but aquatic vegetation is receiving a lot of sunlight and is lush and clearly visible in translucent waters. Up the Jojkica riverbranch where one Common Kingfisher overtook us in low flight and one White-tailed Eagle was checking if the Spongebob may be a suitable-sized prey… and those heavy-bomber wingbeats. Somewhere in front, the male Mute Swan took flight and flew low directly toward us, only to splash us with water while landing right in front of the bow and then, with its wings arched in display and neck inflated to appear bigger, swam in a series of figures of eight, warding us off the area. The female stood on a nest on a pile of floating vegetation in the middle of the river branch, some 200 metres further. The male swam in jerking movements next to the canoe, just beyond the hand reach. To stop… or to go on? There was a lot more to explore and I felt like going on. 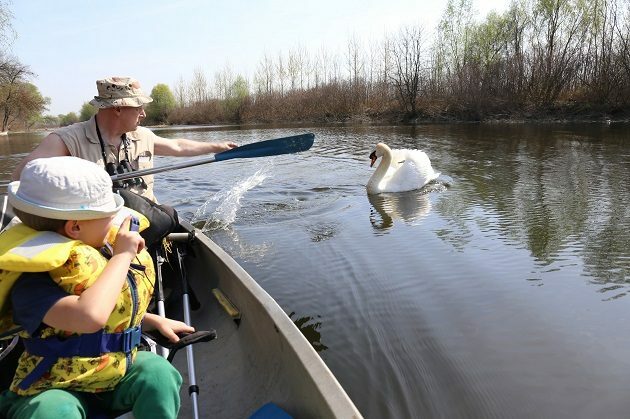 I previously read of kayakers being attacked by swans, but reading and experiencing are two different things and, as it turned out, didn’t really know what we were going into. As we passed him by, the swan clearly disliked my decision. Running on the water, he took flight, but I still wasn’t wise enough to pay much notice. That would change in a moment, when I was literally hit by a bird. It didn’t hurt, but was quite a surprise. 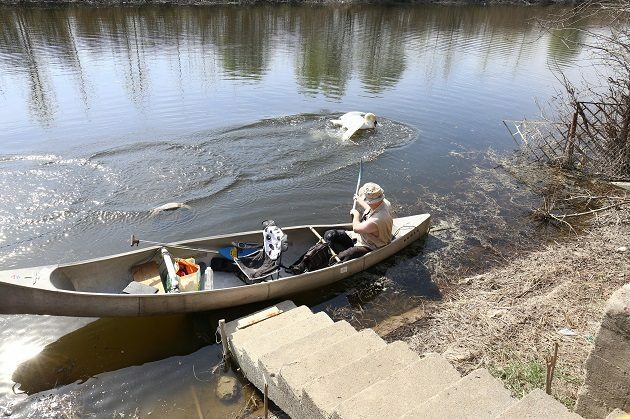 The swan didn’t intend to stop there, but went into another attack, only now I posted a paddle as a guard, so he hit my paddle shaft twice before landing and swimming threateningly alongside of the canoe. Worried that such experience might traumatise young Spongebob, I held the paddle as an obstacle, pointed at the angry bird. Vlada had to learn the same lesson himself, which he did after being hit twice and, potentially more painfully, having his camera splashed. 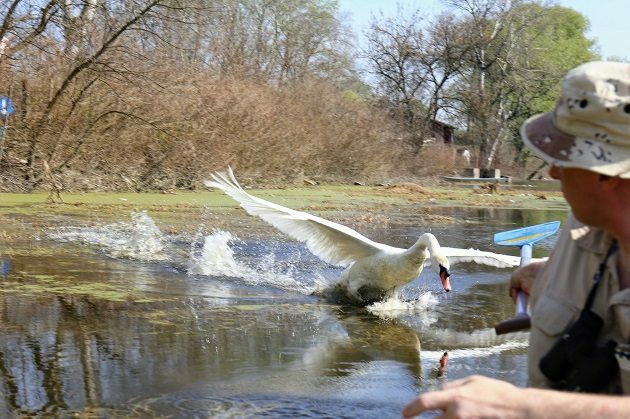 Another surprise was, the swan only used its wings as a weapon and not even once did he try to use its beak. Eventually, maybe 400 metres / 1300 ft and numerous attacks later, we seemed to have reached the end of the swan’s territory. Yet, a mere few hundred metres onward, we had to turn back in front of a thick carpet of dead floating vegetation. That is where Zoran, an owner of the summer cottage at the bank invited us to some juice, cake and coffee. That sort of things only happens when you paddle with a six-year-old – I canoed this river branch for quarter of a century and was never invited to a coffee! I asked Zoran how many cygnets did this pair have last year, to find out that “she laid for three months and they had none”. Zoran enquired if that dead grass on the water can be cleared to allow the navigation, so he could reach his cottage by boat, too. Technically, it can, I say, yet the problem isn’t here, but further up the canal: fertilizer runoff from arable fields bringing new nutrients into these waters, allowing for such lush growth of aquatic plants which will later die off, fall to the bottom and start to rot, using oxygen from the water in the process and releasing methane. To return to the city, we had to go through the angry birds’ waterworld again. 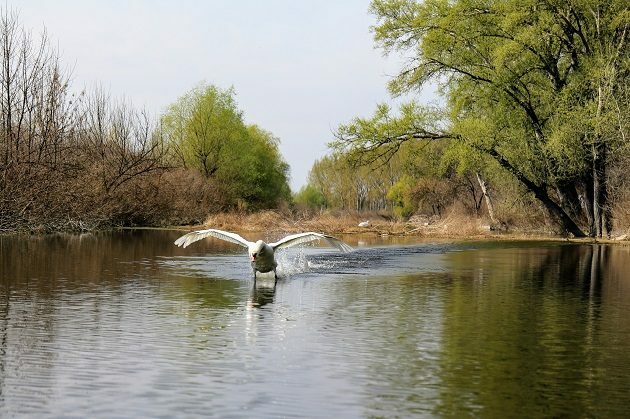 It is worth mentioning that this waterworld makes the downriver part of the already proposed Danube Backwaters nature reserve, the one that was halted by the Government because of the counter-proposal to turn it into a new construction site. I tried to ward the swan off by splashing it with water – trying to speak its language… That didn’t work – he may have understand the message, but was not willing to give up. In that section, the paddling was done mostly by Vlada, while I was guarding off the canoe with my paddle. Great story! Glad you all survived. I also appreciated hearing the background on the surrounding farm issues. Keep up the fight for habitat! I didn’t expect his attacks to actually develop into full contact, nor to last for such a long section of the river branch. If I did, I’d give up in advance. Where Are You Birding This First Weekend of April 2017? Where Are You Birding This First Weekend of January 2011?